In 1917 Dazzle painting, also known as Dazzle camouflage, was conceived and developed by the celebrated marine artist and then naval commander Norman Wilkinson. Dazzle rejected concealment in favour of disruption. It seeks to break up a ship's silhouette with brightly contrasting geometric designs to make a vessel's speed and direction incredibly difficult to discern, and thus confuse and deceive German U-boat torpedo-men. Wilkinson's scheme led to several thousand ships mainly from Europe, USA and Canada going to sea as the largest painted modernist ‘canvases' in the world covered in abstract, clashing, decorative and geometric designs in a myriad of colours. Wilkinson, however, was a conservative rather than an avant-garde artist and this new book explores what really influenced him in terms of developing Dazzle. It traces the development of the Dazzle aesthetic from theory into practice and beyond. It looks at the impact that Dazzle was to have on the modern art movements of Cubism, Futurism and Vorticism, especially in the work of Edward Wadsworth and Wilkinson and his hand-picked Dazzle Section artists. Through an examination of original archival documents, it offers some fresh perspectives into the origins, principles, development and implementation of Dazzle painting, and the competing camouflage schemes. It also examines the claims and counter-claims, and the bitter protracted battle, between Wilkinson and his rival John Graham Kerr for the lucrative ‘Royal Commission Award to Inventors'. Dazzle camouflage was adopted internationally by the major navies, evolving into the more defined ‘disruptive' camouflage, right through to the Second World War and beyond. In the inter-war and post-war periods Dazzle: Disguise and Disruption in War and Art shows how the scheme influenced art, architecture, dance, design, fashion, music hall and theatrical performances and even the exterior appearance of cars. It also features a visual tribute to the vessels that have been painted with brilliant bold patterns inspired by Dazzle to coincide with the First World War commemorations including those by Sir Peter Blake and Tobias Rehberger. The book concludes with an assessment of whether Dazzle painting actually worked and highlights the commodification of Dazzle in fashion and through the sale of a wide range of gifts, prints and merchandise. This book covers an interesting subject, and one which I haven't seen fully told before. The text is well written, keeping the subject interesting for the reader, and the paintings, artwork and sketches are superb and a great resource to the imaginative modeller who feels they would like to attempt some of the wilder schemes. Was listed in Military History Monthly's round-up of the best military history titles of the month. A book for historians, artists and fashion designers all alike, this is a really interesting look at this seemingly strange way of trying to hide something as large as a ship at sea. Naval modellers will find the many diagrams and period photographs invaluable when replicating these complex schemes. A terrific read on a fascinating and hitherto entirely neglected subject. This is a brilliant and visually very alluring volume, thoroughly recommended for its visual enjoyment as well as for its intrinsic historical interest. 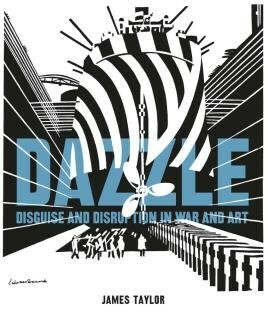 This book is a significant, well-researched contribution to the history of Dazzle and an essential reference on the art form. Mr Taylor has produced a really fine history…Highly recommended. One can only really be guided by the statistics, which speak for themselves. The whole concept of Dazzle is examined in minute detail in this amazing book by James Taylor. James Taylor presents a history of the development and deployment of these techniques of visual disruption in a way that takes into account a wide range of interests in the history of the twentieth century. Taylor offers a fresh perspective on the origins, development and implementation of Dazzle painting against competing camouflage scheme and its subsequent use by major navies worldwide...This attractive book covers both art and military history. This is a beautifully produced and lavishly illustrated volume that provides a comprehensive account of a fascinating episode in the history of both art and shipping. … a wide-ranging, detailed, and well-illustrated book.